Each month, we’ll be getting to know a member of the Red Letter Days staff a little bit better. 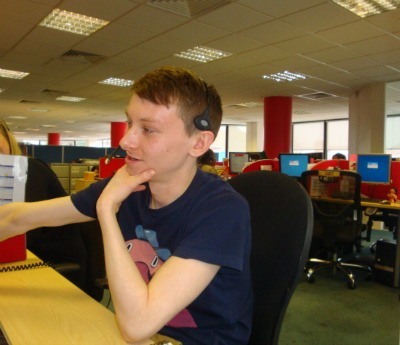 This time it’s the turn of Andrew Atkinson, who works on the Bookings Team. Andrew Atkinson. My parents almost named me Cedric but thought better of it, so I do have unusual middle names: Lesley Cedric. I’m a Customer Experience Executive. I work on the Bookings Team which means I liaise with our different partners to secure bookings and allocations for our customers. How long have you worked in Red Letter Days? It’ll be two years this March. Definitely the people I work with – there is always a great atmosphere in the office. Have you done any Red Letter Day experiences? I have done quite a few, which is an excellent perk of the job. The first one I did was a skydive, which was obviously terrifying. I defy anyone not to be scared when leaning out of a moving plane. It was amazing though, an absolutely incredible feeling and gave a great insight into what it’s like to jump out of a plane! I’ve also been off-roading in a Hummer which was really fun and a bit ridiculous as the vehicle is about eight feet wide. The best experience I have done was an eight hour intensive rally driving day, which felt like more of a short course rather than an experience. I did it in 31 degree heat and learnt lots about handbrake turns, controlling the car on loose surfaces and mechanical sympathy – which is basically how to change gear without breaking the racing gear box, which is a lot more sensitive than a standard one. The whole day was absolutely fantastic. No – I like my extravagances. What have you got planned for spring? I’ve been training for a Duathlon in March which is like a Triathlon but with no swimming. I cycle about 25 miles every day so that has been a big part of my training. I try to go for a run every other day, but it’s been difficult with the snow and stuff. I’ve been feeling better in myself since I started training – more energetic and happier so I would recommend others to try something like it this year. The one downside is that I can no longer eat bacon every day. What’s your typical lunch in a working day? I like to call it “The Atkinson Diet” – I usually have a toastie or a wrap and have become known around the office for my extravagant concoctions, which include ham, tomato, spinach, rocket, sweet onion marmalade, a creamy cheese like a gouda or an edam, radishes, tomato and red pepper chutney, horseradish and herby cheese. Thanks Andrew, it’s been enlightening.